Sand compaction piles provide lots of benefits like enhancing the durability of ground, controlling liquefaction, minimizing settlement and equivalent applications. Under this system, a hollow steel pipe is pushed into the ground. The bottom is ceased with a collapsible plate down to the necessary depth and then pipe is stuffed with sand. The pipe is detached when the air pressure is driven opposing the sand inside it. The bottom plate opens throughout removal and the sand backfills the vacuums formed previously at the time of pushing the pipe. The sand backfill resists the soil that encircles the compaction pipe from falling while the pipe is withdrawn. All through this process, the soil is solidified. 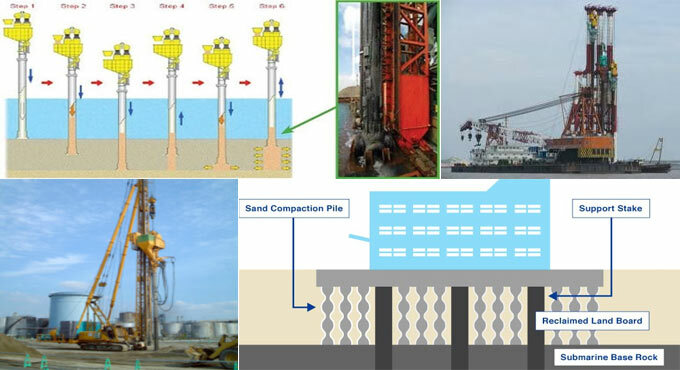 Based on the system provided, two types of sand compaction piles exist. One is vibratory system having vibro-hammer and another is a non-vibratory system having forced lifting or driving device. The vibro-hammer that is utilized in this method can create problem with vibration and noise to the encompassing environment. So, it is not recommended to apply this method in the urban areas or at areas adjacent to existing structures. To get rid of these issues, a system with a non-vibratory Sand compaction pile method should be employed that does not need vibration on the driving device to infiltrate into the ground. The equipment comprises of a sand compaction pile driving device that is applied as a base machine and a forced lifting or driving device containing a rotary drive motor to revolve the casing pipe. • Arrange the casing pipe to the planned location. • With the use of the forced lifting or driving device, set up the casing pipe into the ground at the time of rotating. • The sand is supplied through upper hopper as soon as the pipe attains the necessary depth. • Casing pipe is pulled up and as a result the sand is pressed out to the void with compressed air. • The casing is then removed together with the compaction of the pressed out sand pile to expand it. • The method is reiterated unless the sand piles are created to the ground surface. Pros and cons of sand compaction piles: The main benefit of these sand piles is that the sand used is inexpensive as compared to other similar ground improvement methods like stone columns. The construction process of the sand columns is very quick. Once, the hole is formed, it’s completely supported by casing throughout construction that restrains the chance of collapsing the structure. Sand compaction piles contains a low stiffness with regards to other methods. So, the greater quantity of weak soil should be replaced. These piles do not contain adequately high permeability to function since effective vertical drains all through earthquakes. Sand compaction piles are useful for making pervious embankment foundations stronger against liquefaction or impervious foundations against durability issues during an earthquake.